Without question, statistics is one of the most challenging courses for students in the social and behavioral sciences. Enrolling in their first statistics course, students are often apprehensive or extremely anxious toward the subject matter. And while SPSS is one of the more easy-to-use statistical software programs available, for anxious students who realize they not only have to learn statistics but also new software, the task can seem insurmountable. 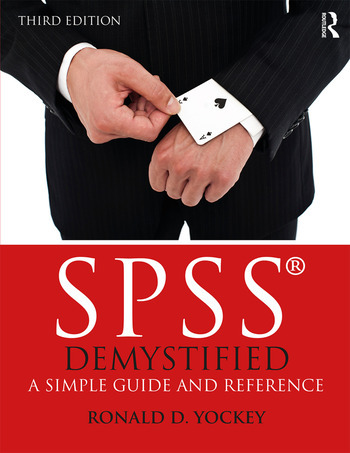 Keenly aware of students’ anxiety with statistics (and the fact that this anxiety can affect performance), Ronald D. Yockey has written SPSS Demystified: A Simple Guide and Reference, now in its third edition. Through a comprehensive, step-by-step approach, this text is consistently and specifically designed to both alleviate anxiety toward the subject matter and build a successful experience analyzing data in SPSS. Features and updates to this edition include: material updated to IBM SPSS 24 (available Fall 2016), including screenshots and data sets/end-of-chapter exercises. Ronald D. Yockey, an award-winning professor of Quantitative Methods, has been teaching statistics at the undergraduate and graduate levels for nearly 20 years. While enjoying both teaching and research, Professor Yockey’s greatest professional thrill is in seeing others discover that statistics is a subject that can not only be understandable, but can also be fun!